The craftsmanship of Peterson Real Fyre Designer Series Gas Logs captures the realism, texture and subtle nuances found in nature. These hand painted originals, modeled from real world samples, are sure to add a touch of elegance to any home. Designer Plus series features more natural color and bark details. The ends of the logs and split pieces are a different color than the bark, and they include red feather detail painting, giving the logs the most authentic look. This Peterson Real Fyre gas log set includes: Ceramic Refractory Vented Gas Logs, ANSI Certified Vented Burner with Pre-Assembled Valve and Regulator, Piezo Ignitor, Custom Grate, Connector Kit, Glowing Embers, Vermiculite, Burner Clips, and Damper Clamp. The Peterson Real Fyre Vented ANSI Certified G46 Burner features a T-shaped burner pipe. The T-shaped burner contains a large pipe in the center of the pan and a smaller pipe that runs through the ember bed. This allows the flames to not only dance through the center of your log set, but through the center of the ember bed, which gives you a more realistic flame pattern. This burner also contains a patented system that features a hidden factory installed control valve, and piezo ignition at the rear of the burner. It has a BTU output of 40,000 BTUs. This set features a manual safety pilot valve. The ANSI Certified G46 Burner is available with all Peterson valve controls with or without remote controls and in multiple size sets. 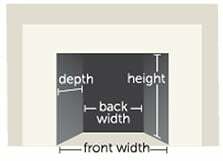 Minimum Rear Width Required 20"
Vented Decorative Gas Appliance Limited Warranty. All Peterson gas logs are warranted for as long as you own them (lifetime). All Peterson burner assemblies are warranted for ten (10) years. SPK-26 controls are covered by a three (3) year all parts warranty. All other Peterson valves, pilots, and controls are covered by a one (1) year limited warranty (excluding batteries). Shoppers choice sold me a set of gas logs at a great price and service was awesome . I use these logs everyday I love them especially in the cold North Winter. I love how real these logs look. They are heavy too, not just something that's real light and flimsy. Every time someone comes over they think I have a real fire! When we got this set it, we couldn't believe how realistic it looks! The logs are pretty heavy so you know they are well made compared to the really light logs. It is so easy to use and looks great in our new home! Love it and happy with our decision. Bought this set and had it professionally installed. I had seen some sets before at local shops and wasn't too sure how these would actually look, but they really surprised me. They look great! Also went with the bright embers... maybe that makes a difference, don't know, but they really look good in the fireplace and I am very pleased with this set. WOW, I have never found an online company that delivered BETTER than listed. The gas logs not only arrived undamaged, they are so realistic and arrived in two business days. I cannot say enough about ordering from this company. My hats off to everyone that was involved. Thank you so much the logs are fantastic. This was inserted in a woodburning fireplace. It is so convenient to just turn it on when you want a fire and off when you don't. Ends leaving the flu open all night after a wood fire. Great set of logs. I am very pleased. We've wanted gas logs for some time, and we bought these because R.H. Peterson produces a good quality set. We have now used this set for a couple of weeks, and we are very pleased with the appearance and performance. I couldn't be more satisfied with the authentic look of my Peterson Gas Logs 20 Inch Split Oak Vented Logs with G45 Burner. I resisted getting any of the other extras offered "to make the fire more realistic" until after I installed the logs. I am glad I did because the look of the logs is great with just the pieces included in the kit. After we had burned the logs for a few hours, there is a build-up of soot on the logs which adds to the realistic look. My husband is handy with tools and we had no trouble with installation. After we finished the installation, we experimented with just the right placement of the logs to make maximum use of the extra burner flames toward the front of the grate. This took much less time than it took to get just the right furniture arrangement so I can view the fireplace when I am in the kitchen. My brother lives in the Adirondack region in New York and is a real wood fire purist. I can't wait for him to see my log set burning and pass his judgment. I am sure he will be pleasantly surprised and agree that I didn't sacrifice a good looking fire for the sake of ease and convenience. We love our new gas logs! My wife and I spent a month driving around town looking for a new gas log set to replace the cheap one the home builder installed. After using the website videos and seeing how easy it was to install on our own we decided to purchase from [$] We saved hundreds over the local competition.We have had the set for about a month and have used it every night. Everyone who stops by is amazed by the realistic look of the logs and how much heat the set put off. We also recommend the upgraded embers; they really do make a difference. I found this product to be great looking and it functions just as expected. I use it in my fireplace in the living room. It adds to the ambiance in a wonderful way. The Peterson Real Fyre Split Oak gas log set looks so realistic. Much attention to detail is taken when hand-painting each log. The logs and twigs give the appearance of being split. The outer bark and the interior of the logs are painted differently, using multiple layers of color and texture. This gives them their realism. Peterson makes their logs from a proprietary blend of refractory ceramic. They are reinforced with steel rods which really raises the integrity of the log. Who doesn’t love a lifetime warranty? The logs are warranted for as long as you own them, and the burner assembly is warranted for 10 years. 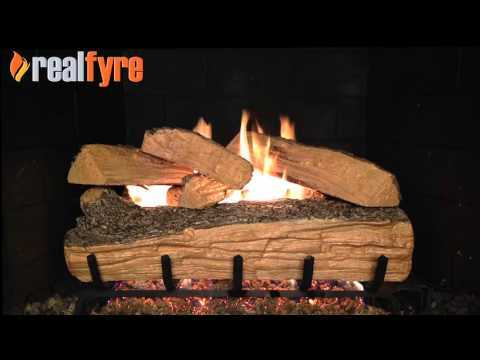 See the Split Oak Gas Log Set in action.